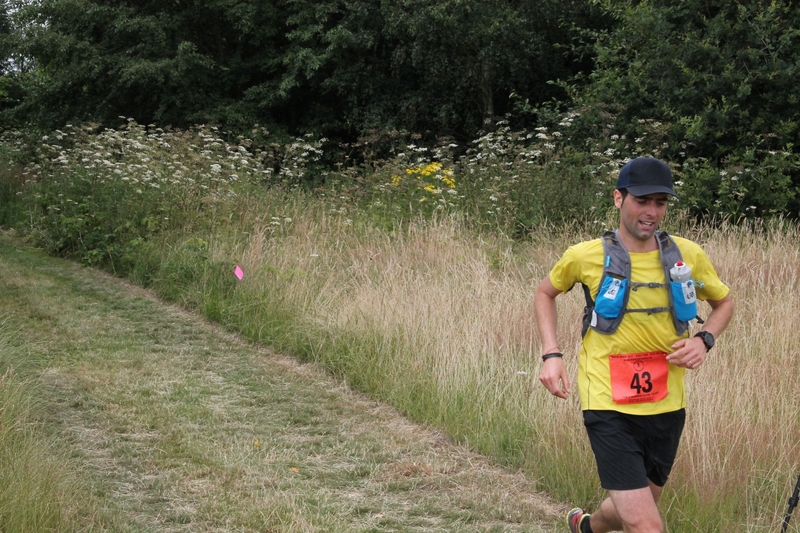 Last Sunday I went back to the North Downs Way to run the NDW Marathon. The first edition of this race organised by Hermes Running, the same people that organised the Thames Meander I ran in March. 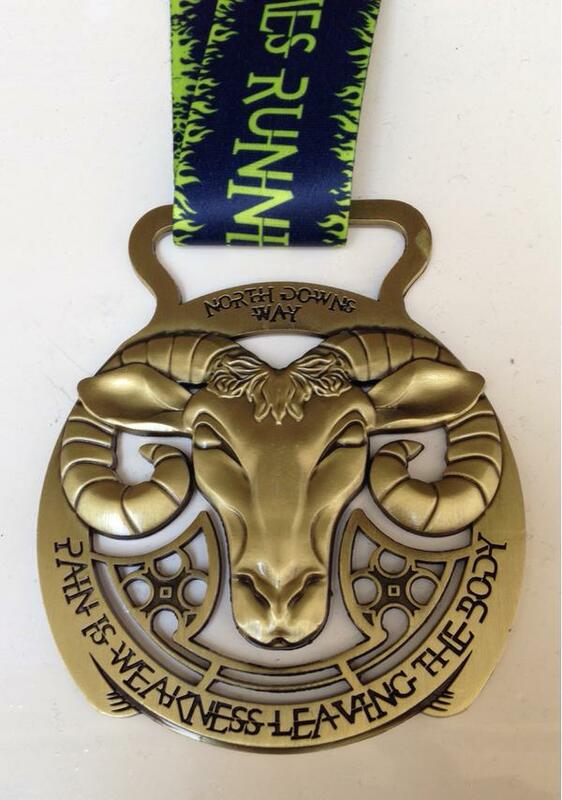 I loved the NDW when I first ran on it during the NDW50 and I was keen to get back there. The day started with pouring rain but by the time I was at the Reigate Golf Club (where the race HQ was) the sun was out and it looked like it had no intention of raining again. I had to park quite far away from the starting line, but that gave me the chance to get to know a couple of other guys including one I ran the first kms with, which is one of the reasons I like going to races. After a bit of pre-race briefing by race director David Ross with his cool Western States buckle we were off. Some people in front just disappeared straight away. I had no intention of letting the excitement make me run too fast and I decided to stick to a 5 min/k on flat, run fast downhill and do whatever possible uphill. I was feeling quite good. The sun was shining, the woods were thick and the paths were perfectly dry. I did not even feel the first uphill bit. 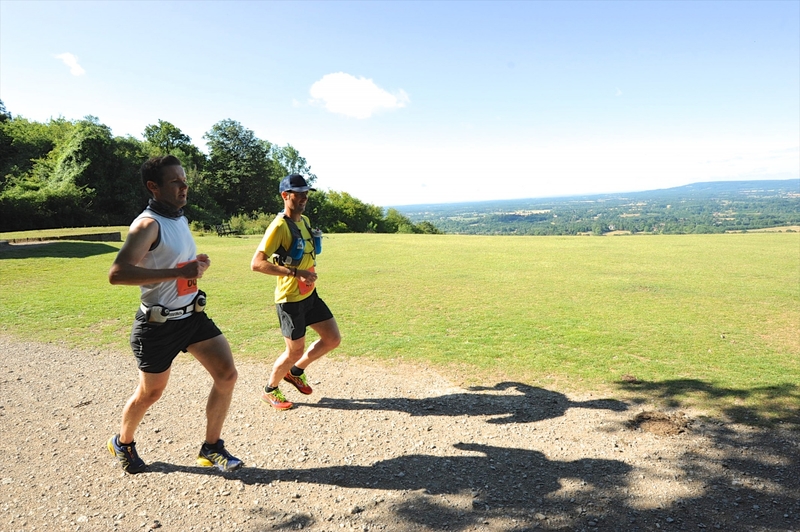 After around 5k we were at the first big downhill, Reigate Hill. I remember doing it uphill during the NDW50 and it was as steep as I remembered it. I decided to go down fast. A lot of small steps and boom I was at the bottom pretty fast feeling like a hero. I started overtaking some people. I remember hat part as being the bit I liked the most during the NDW50 but doing it the other way round I did not remember it much. I was going to do it again on the way back so I was curious to see if I was going to get some flash back from May. At the 10th km there was another climb and on top of that I should have gone right and kept at the top of the hill until the famous Box Hill steps. Instead I took the wrong turn and went straight down. I thought I was going fast and instead I was overtaken by two guys (not taking part in the race) that were going at least twice as fast. Amazing speed. My eyes were watering, I could not go faster than that, I was scared of tripping and these two guys went down like missiles. I later discovered they were @TheGingerKenyan and @kendall_danny. At the bottom I found myself with the first lady and we both realised we were in the wrong place. The two guys told us how to get back to the Box Hill steps and off we went. I don’t think we lost much time, but we had to do an extra climb to find ourselves back on Box Hill. The downhill on the steps was fun, but my legs were starting to complain a bit. I was happy when I got to the stepping stones. After crossing the A24 we ran up the asphalt road that I hated doing downhill at the NDW50, the bit through the vineyards. Doing it uphill was not too bad and after 2 more flat kms on top of the hill and through some woods we arrived at the halfway point where we turned around and started running back. I felt quite good. I was 10th (I counted the runners coming back). Stupidly I forgot that the worst part is after the 30th km and the good feelings I have at 21k do not count. Like an idiot I tried to keep my 10th place and ran a couple of kms at 4:30 but then the downhill via the vineyard really killed my legs and I started losing positions. I was happy when I arrived at the stepping stones again and I stopped for the first time at an aid station. I took some extra water and started going up the box hill steps, walking for the first time in the race. When I arrived at the top I had lost 2 more positions and my legs were broken and still had 15km to go. The rest of the race was just pure suffering. When I was running I was doing 6 min/km, but when the trail was uphill I had to walk and ended up doing some very slow kms. Cramps were always around the corner and I started eating salt sticks every 20 minutes, I even chewed one and almost puked, disgusting. 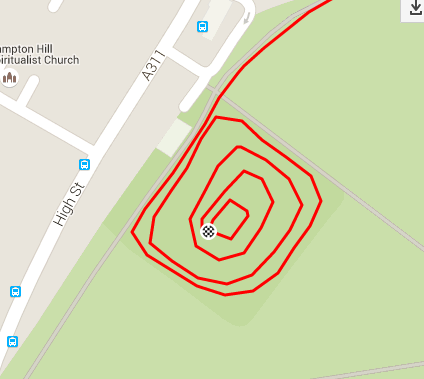 At the 37th km I walked up Reigate Hill. It felt like vertical, a lot harder than when I did it at the NDW50 even if I only had 37k in the legs and not 50+. At the top I could not get the legs moving and spent too much time walking and chatting with a guy on a horse. I then shuffled for a bit until I got to the last aid station, 1.6 miles before the end. I probably stopped to drink there for too long and two more runners caught up with me. As it was the end I tried to fight not to lose more positions. One guy stayed behind but the other one, a 60+ veteran, was just too strong. We did some bits at around 4:15 min/k and still as soon as there was a uphill part he was too strong for me. I finished 22nd in 4 hours and 8 minutes. As always I think I should have paced myself better and saved my legs a bit more on the downhill bits. It’s quite a difficult trail, but I really enjoyed the day. I had a couple of kms where I hated myself for being there, but the rest was fantastic. The belly, for the first time in a marathon, have not given me any problem. I stuck to my gels and just water and did not get anything strange form aid station this time. The medal at the end was also the biggest one I have ever received. Beautiful day on the trails, met some nice people, seen some nice scenery, wasted my legs a bit, all in all: a happy day. If you are interested here is the Strava upload you can check it out here. This is the tapering week before the marathon on Sunday. So I rested a bit, ran less and no speed training. On Tuesday I did 11 km taking it very easy. I tried to never get my heart to go over 135bmp. I feel like my slow days are not slow enough, so this time I really put an effort in trying to go slow. On Wednesday I ran 14.5k on the river and Richmond Park, again exploring new paths. It was fun, a bit of rain, lots of young deer running away from the bushes, a good way to start the day. I rested on Thursday and then on Friday went for a 10k run in Bushy Park. I think I have been a good boy this week and managed to avoid going too fast and getting tired. I cannot wait for race day. An interesting event of the week was taking part in a Brooks twitter competition and winning! I never win anything, but thanks to this tweet I won a place at the Cardiff Half Marathon and some kit from Brooks. I am looking forward to seeing what they send me. I was not planning to do that race as it is not close to home and it is quite a busy one, but I am now quite excited to try a road half marathon and visit a new city. Shame it happens very close to an 50k race I plan on doing the week before. More info on my races schedule coming soon! So in total this week I have only run 36km which should have left me full of energy for the North Downs Way Marathon. Check out my report of the race in my next post. As promised I have not been very active on this blog for a while after the NDW50 climax. It is in a way a reflection of my state. After months of trepidation and preparation, after finishing the 50 miles I did not have anything “big” to look forward. I felt a bit empty. I am running 2 half and a full marathon in the next 2 months, but they are not the same as preparing for an ultra. I missed a bit having that event to look forward to. That did not stop me from enjoying running and I kept training at least 6 times a week. I ran less, but faster. I have worked on trying to get some speed back in my legs. I slowed down quite a lot in the final months before the NDW50. I have been looking at my Strava from last year and I was at least 15 sec/km faster in all my training sessions. So I made sure to have at least one interval session a week and if possible a tempo run. The first week I did an easy 10k run on Tuesday, a speed session on Wednesday (3k WU + 5x(500m at<3:40 + 1:30r) + 4k CD. Then on Thursday I did 15k but I was really tired. I did a sort of progressive run. On Friday I did a 5k warm up and then 5k going at 3:50 min/km. I was quite tired by the end of the week but I decided to test my speed by taking part in the Bushy Park Parkrun that I had not done in ages. They had to change the course so I was curious to try it. It is still a very nice run except for a bit at the start where if you do not run at 3:30 min/km you might find yourself stuck with a lot of people going through a small grassy area. I enjoyed it a lot. I did not do my PB but I was close. I finished 14th overall in 18:20. I was first in my age category which is a nice thing. I ran most of the race with a 13 year old kid that was very impressive. I overtook him the first km and thought I would never see him again and instead he steadily caught up with me and finished 2 positions ahead. Nice one! The day after I had a little accident. I wanted to go for a long run but I was really tired. So much so that I was not careful enough and kicked a rock and tumbled on the ground, in the mud. I got up and washed my bloody hands and knees in the river Thames and started running again as if nothing had happened, but I was not feeling too good. I only run 15 more km and went home. My left toe was not in a good shape and when I removed my socks I was scared of what I would find. It was not too bad but it affected the next week. Overall it was an 85k week, shame for the Sunday fall. The second week of my speed training started badly. On Tuesday I did 10k in the rain and wind to see if my toe was ok. It was not too bad but I ran with a different form and ended up making my ankle hurt a lot. I could not walk by the end of the day. So I rested for one day and ran again on Thursday and did 15k to get rid of all the thai food and beer I had the day before with my wife. On Friday I did 12 more km, at a relatively quick pace. Saturday I went for a longer run. I had not run more than 15k for quite a bit, so it was good to go out for longer. I did 31k at 4:44 . Wonderful sunny day on the river. Loved it. I completed the week with 15k at 4:27. I was definitely feeling better and getting over the toe issue. And so I completed another 85k week. I was quite happy with the average weekly pace increase. Next week I will keep on working on speed and see if I can get some nice results.